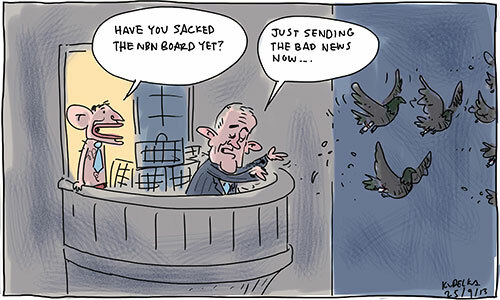 Posted in political cartoons, The Australian and tagged turnbull, abbott, nbn, board, pigeon. Thank you Mr Kudelka for your life-like depiction of both these eminent Australians. Clearly apparent to all who have sought access to above portraits, our Australian Jock-ey Shock PM illustrates he is most unaware of the difference between broad-wing and broad-band delivery speeds. A second rate system from a second rate Coalition!